At the end of August I was lucky enough to win a giveaway from Green People hosted by Amie from The Curvaceous Vegan. 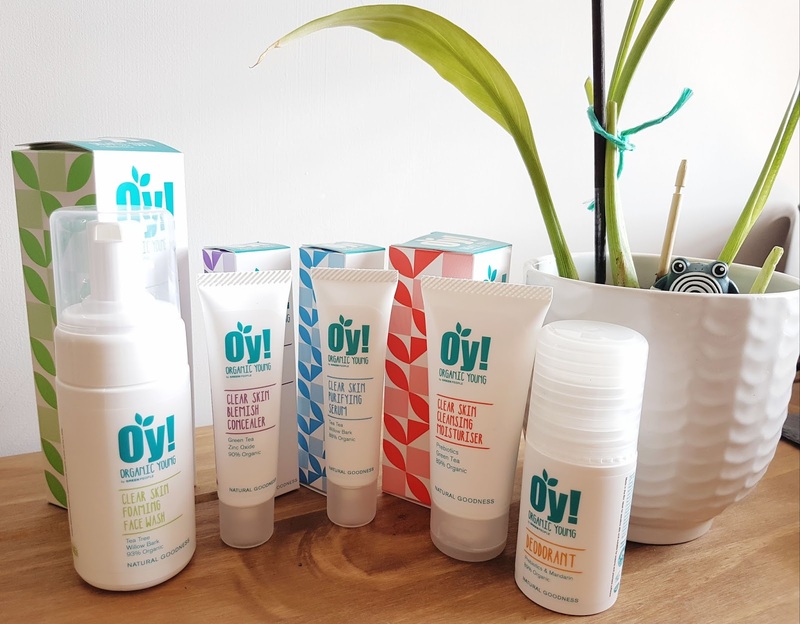 I won lots of products from the Organic Young range, and I've been testing them for a while now with the intention to share my thoughts about them with others who might look for the same things in cosmetics as I do: natural and organic ingredients, and of course cruelty free and vegan credentials*. I'm always incredibly dubious to write beauty reviews without giving products a really good road test as I've been burnt a few times when purchasing products after reading a hastily written rave review and ended up thoroughly disappointed and out of pocket - however, I feel I've been trialling these for long enough to have an informed opinion on my first ever Green People products. *Please note the Clear Skin Blemish Concealer is not vegan: see review below for further details. This is a thin foam face wash which comes with a pump-style applicator. I either use this in the mornings or as a second cleanse after using an oil-based makeup remover. It can be washed off or left on the skin (I do the former as I was concerned it might be drying when left on the skin) and feels lightly cleansing yet not at all harsh. Although I like this face wash, it did not improve my skin significantly - it's pleasant to use and works as a cleanser but it's simply just not the right product for me. I think it would have been great for my skin when I was a teenager, or for anybody who likes a light blemish-fighting face wash made from natural ingredients rather than the harsh chemicals you'd typically find in high street equivalent products. This remains in its packet to be donated to a friend as it's so dark on my fair skin I could practically contour with it! At the time of posting, this concealer is only made in one colour which I think is impractical even with a sheer coverage concealer. It also contains beeswax so is not vegan. I really like this serum - it's surprisingly thick so a little goes a long way and it felt really soothing to use on my skin at night when my blemishes were at their worst. I do feel it assisted in helping to reduce them and speed along their healing. I'll be honest - I'm not very good at targeted skincare so I used this all over my face at night even though I only tend to break out on the lower half, yet it didn't make my forehead feel dry or stripped as some equivalent products tend to do. All credit to Green People for creating something effective at fighting spots that is still balancing on non-problem areas. I have used this most days since receiving the product and would repurchase this as it is a really lovely light moisturiser to use in the day time. I've carried on using it even since my hormonal breakouts have healed because it sits really nicely underneath foundation and doesn't get too oily throughout the day - this is vitally important to me as I want my makeup to last for the 12 hours I'm out the house and I loathe needing to touch it up if it becomes overly shiny! The consistency when applying this is thin and it spreads very far: like with the serum, a tiny amount is enough. It was still very comfortable to apply when I had a few sore spots and I felt it was working at fighting the blemishes even under my makeup. This was the product I loved most of all. I prefer to use natural deodorant and this is an effective natural and organic roll-on deodorant made without alcohol or pore-clogging aluminium. The orange and vanilla scent is gorgeous and feels very soothing on the skin, and it did its job even on long, busy days. Unfortunately I used it up too quickly (this is something I am in the habit of doing after years of dousing myself with masses of antiperspirant - I'm working on learning to trust that natural deodorants still work without needing to use half the product in one go) but I would absolutely repurchase this and certainly be interested in trying the other natural deodorants from Green People's range. Another reason to support Green People aside from their organic and cruelty free credentials is because they donate 10% of their net profit to charitable causes which I think is generous and inspiring. I'm pleased with the quality of these products and most importantly feel all are effective in what they claim to do. Though not all are perfectly matched to my own skin requirements, since trying these out I've definitely felt encouraged to try something else from Green People in the future from a range more targeted to my specific skincare goals. These have certainly stepped up the mark for me when I have needed them! I'd like to say a big thank you to Amie for hosting this giveaway, and Green People for the lovely products and incredibly fast delivery. Have you ever tried products from Green People? I'd love to hear your experiences and recommendations! I've never heart of Green People before, but I'm really intrigued to try the deodorant, moisturiser and serum now! Love how ethical they are, and that they donate to charity. I'll definitely be checking them out.